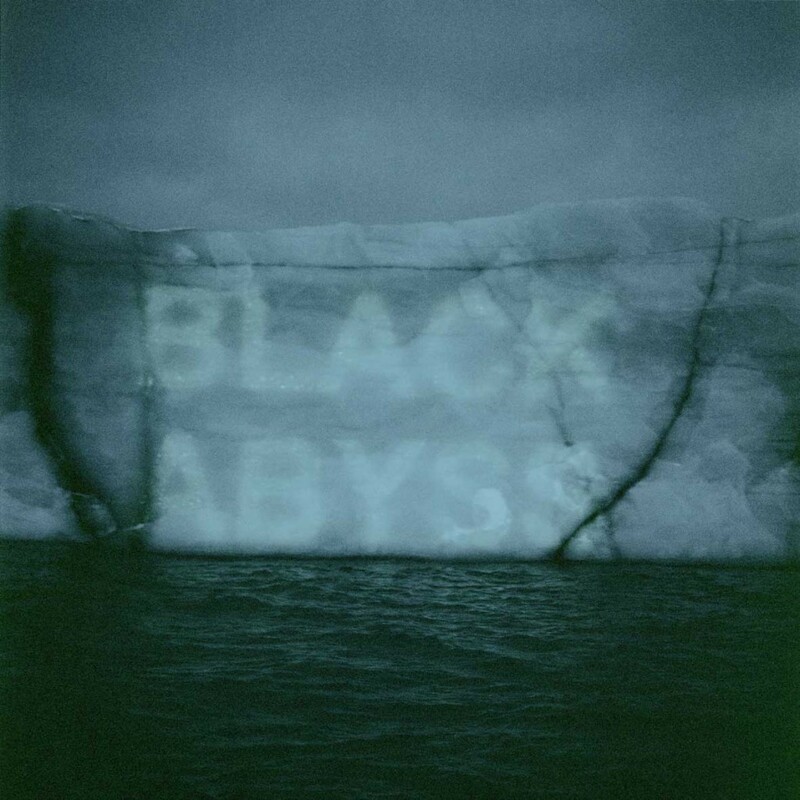 Artist, film-maker, writer, curator, and founder and international director of the Cape Farewell project, David Buckland’s focus of enquiry is embedded in what we touch, intellectually and physically. 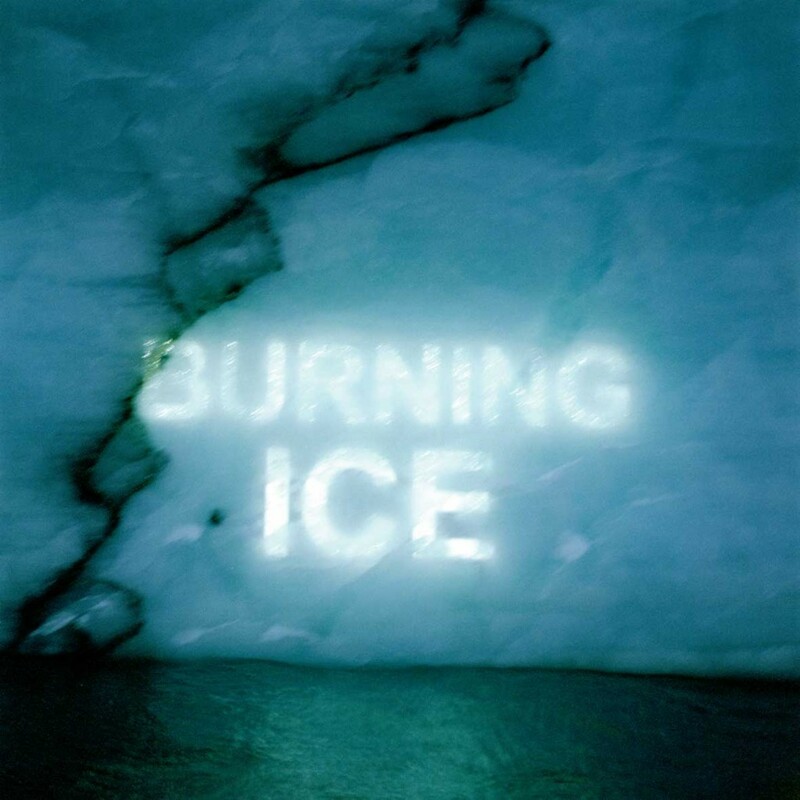 Curator of ‘eARTh’ for the Royal Academy 2009, U-n-f-o-l-d for Cape Farewell 2010, and Carbon 12 for Paris 2012, he had also produced the films ‘Art from the Arctic’ 2006 for the BBC and ‘Burning Ice’ for Sundance, 2010. 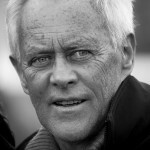 In 2001 he created and now directs the international Cape Farewell project – www.capefarewell.com. 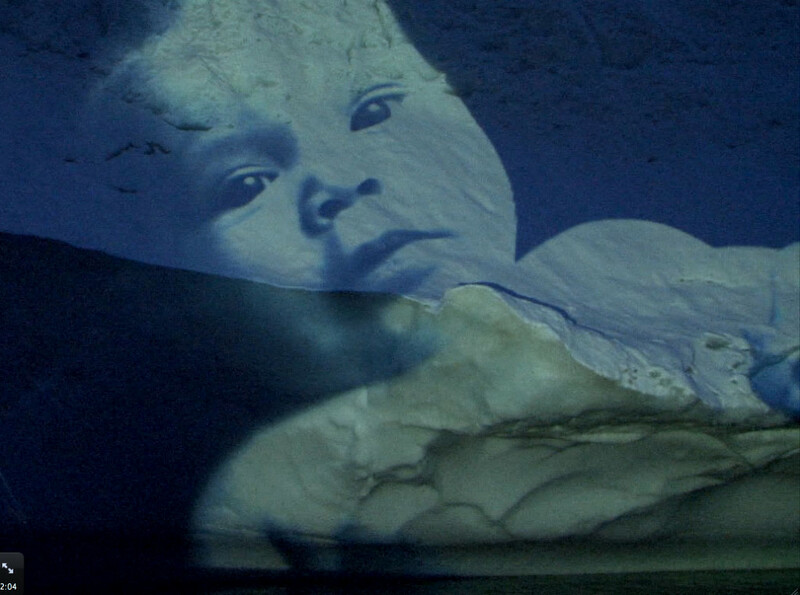 Bringing artists, visionaries, scientists and educators together, Cape Farewell continues to build an international collective awareness and the cultural response to climate disruption. Fifteen years ago I had become curious why scientists were interrogating how we humans were beginning to have the capability and power to alter the natural systems that govern our planet and how disruptive these forces are – after ten thousand years of the Holocene we have now entered the age of the Anthroprocene. 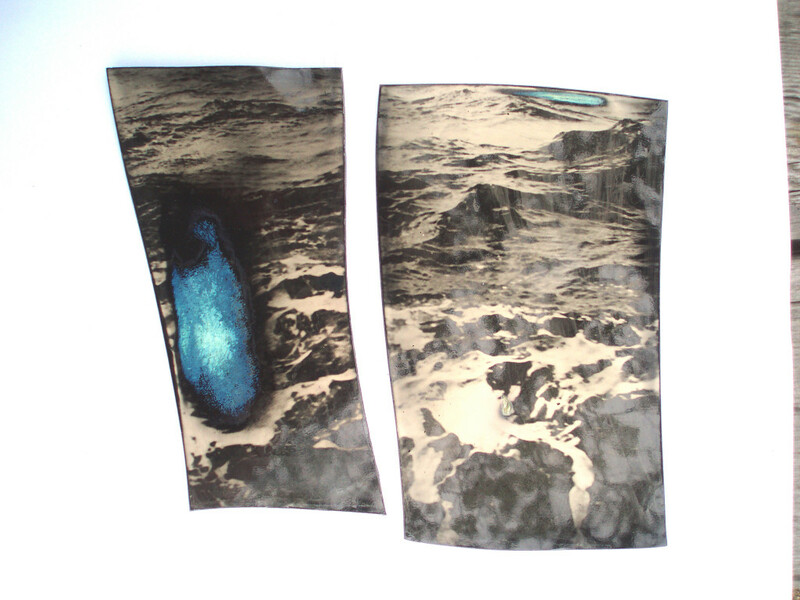 This artistic curiosity strongly influenced my artistic practice and led to me to creating the Cape Farewell project. The science language was complex, abstract, data heavy and their work is subject to peer review, all of which is not user friendly to the wider public. 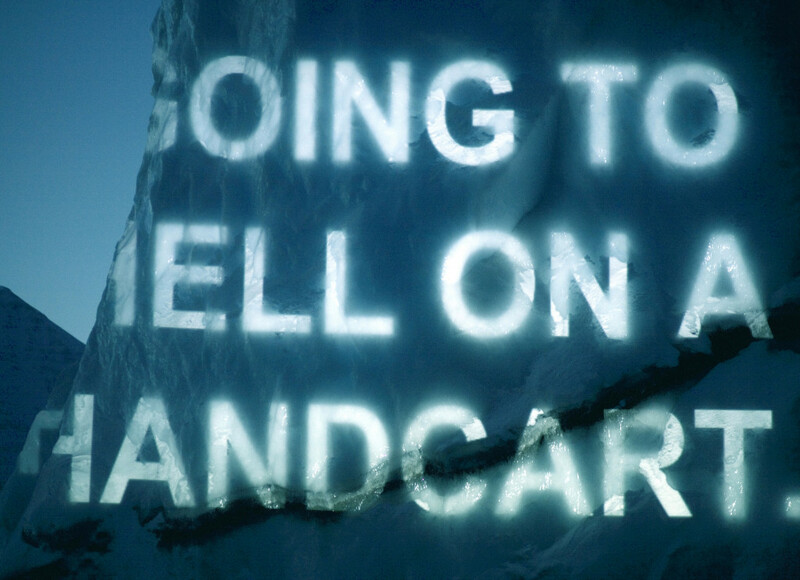 The Cape Farewell project’s ambition was to imbed creative’s – artists, writers, musicians, film and video makers – with the climate scientists to craft a new people-friendly language for climate change. How could we make the scientifically troubling notions of 3 degrees temperature rise, dangerous weather events and arctic ice melt relevant to someone living on a day-to-day bases within their own urban environment? 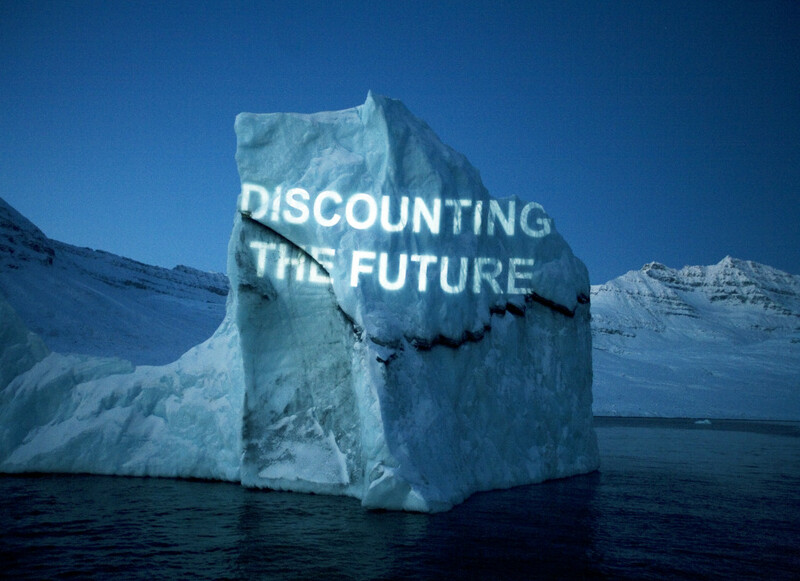 During these fifteen years over 320 artists and creative’s have worked directly with the Cape Farewell team, producing major television films, books, operas, plays, virtual reality videos, web sites and festivals which all re-map climate change as ‘climate is culture’. The scientist tell us we have a very serious problem but the causes of climate change is the way we have evolved our complex societies dependent on fossil fuel for energy. Climate is about our societies culture and we need a shift in cultural priorities if we are going to address what has been called ‘human societies great ever challenge’. (Sir David King, UK chief scientist). 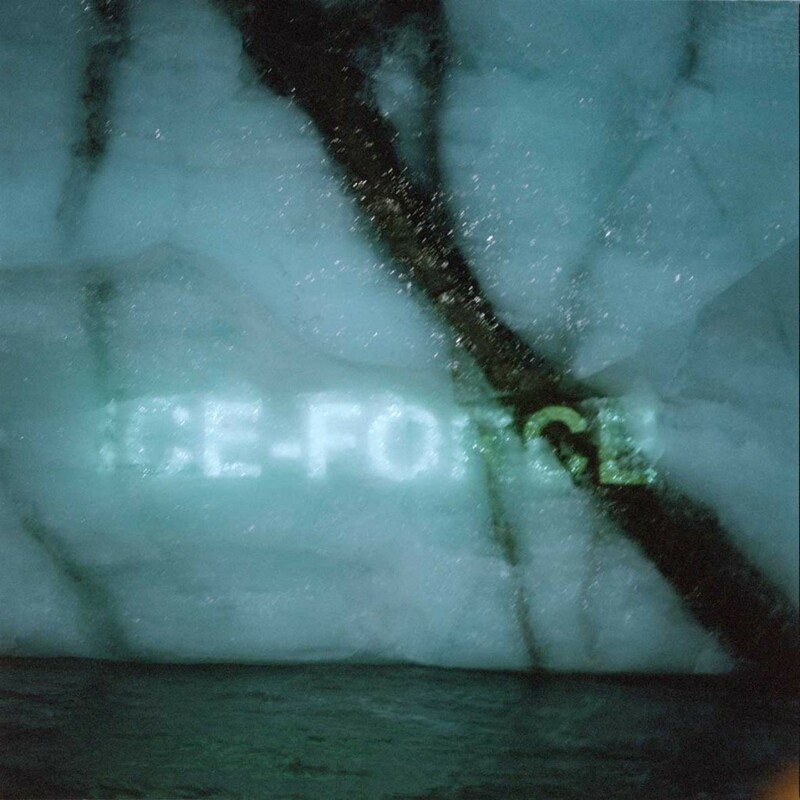 For the past 7 years the Cape Farewell project has moved from communicating the threat of climate change to try to find and inspire cultural solutions. In 2015 we became the cultural partners to Cop21 and launched with our French partners COAL, ArtCOP21 in Paris. To underline the power and willingness of the public engagement with the climate challenge, ArtCOP21 staged 554 cultural climate events in 56 countries whilst at the Cop21 UN climate talks acclimate change accord was agreed and accepted worldwide by over 140 countries. (except in the Trump retro universe). 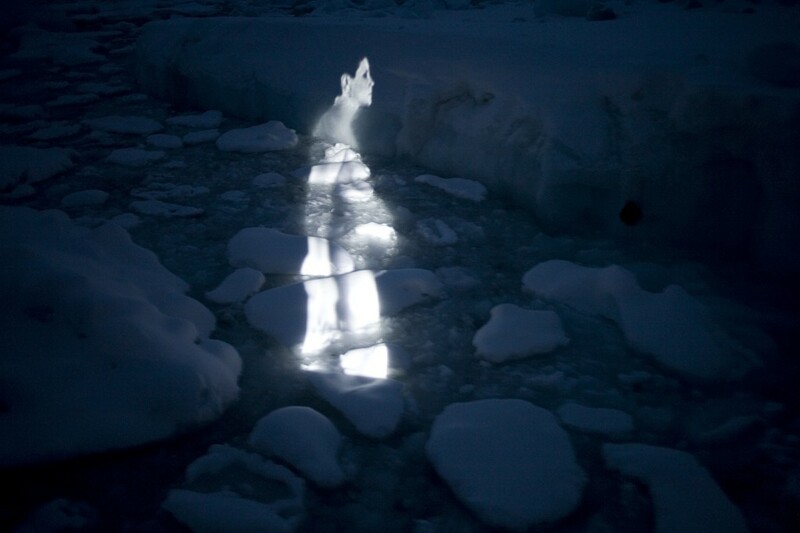 Throughout the 15 years of Cape Farewell I have continue to practice as an artist whilst leading eight expeditions into the High Arctic, organising with the Cape Farewell team festivals in London, Toronto and Paris, producing two films, one for the BBC and raising millions to keep the Cape Farewell project afloat and active. 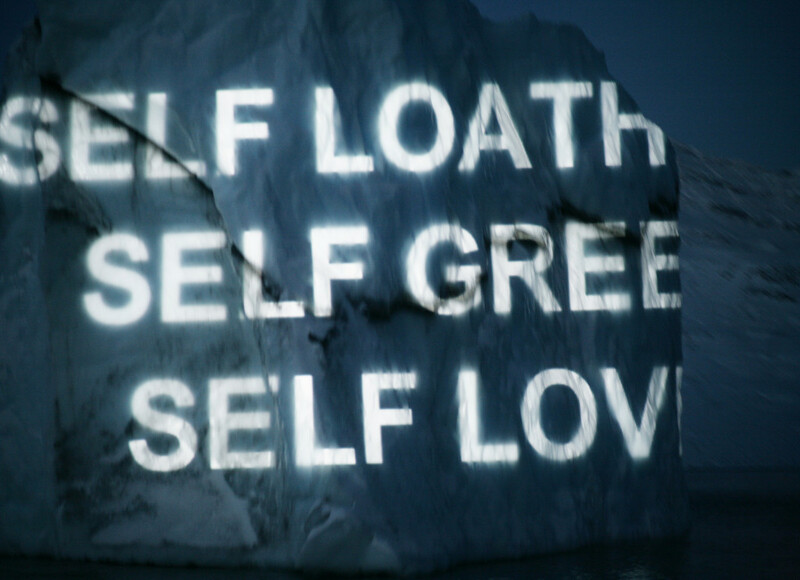 As part of the Melbourne Climarte festival in 2015, I exhibited a survey of my climate-focused art. It was exciting for me to see my artworks gathered together in one exhibition. It also brought into focus for me the challenges and dangers of making issue based art. Any culture is reflected in the writings, artworks and films of its artists and they reflect the age in which they live, this I believe is a central activity of art production, a celebration, a critic, a beauty and a record. To ask art to be pro-active as an instrument of cultural change, to become a political force, walks a dangerous tightrope where the freedom of artistic enquiry is open to the potential pitfalls of temporal activism and protest. 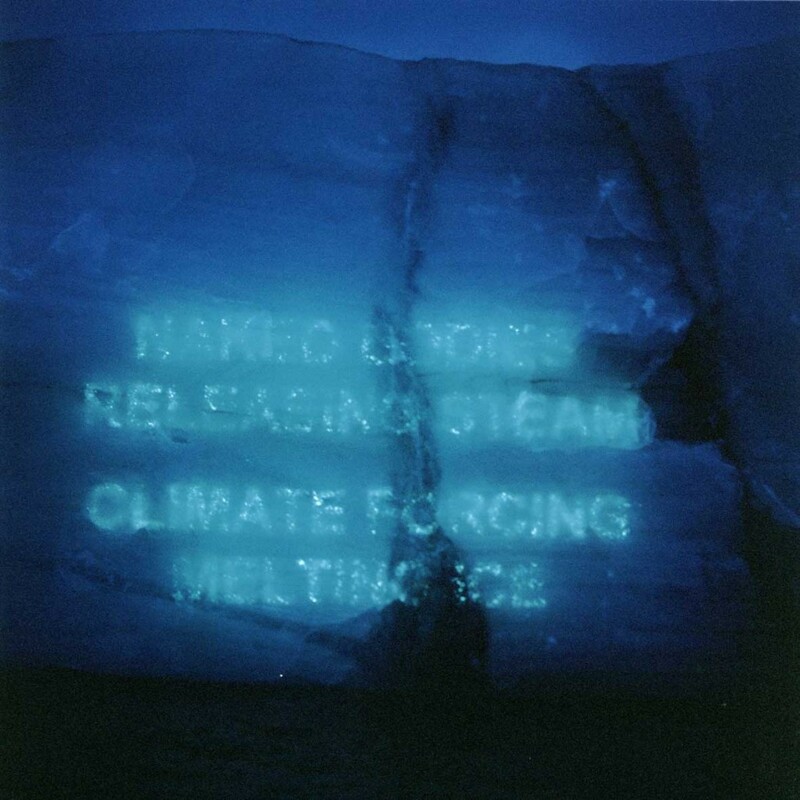 Yet this is the ASK of Cape Farewell where celebrated and skilful artists have addressed the challenge of climate change. 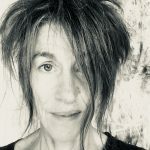 We as artists live in the milieu of our times and climate is a profound civic challenge which if not addressed will wreck civilisation as we know it, so it is understandable why so many creative’s have addressed this challenge within their work. In part this is to comprehend the Anthroprocene – its implications, and how to get our global society to change and accept the responsibility that humankind is now an equal in power to the forces of nature. The High Arctic is a sublime canvas and as I worked as a lens based artist, it was my obvious start point for my artistic enquiry. As much as I celebrate photography, it is a challenge to get it to represent the values and desires of 21st Century urban society. Much of these values lay hidden from the (camera) view which has led most of my work to focus on creating ‘performances’ which are then photographed – witness my exhibition ‘Performances’ at the Natural Portrait Gallery, 1999. I also brought to the challenge my passion for the old photographic processes, which explore the physicality of the photograph – the pure tactile quality of the surface of the image which when combined with the cerebral de-coding or ‘reading’ of a photograph allowed me to explore a more complex and at times sublime narratives. 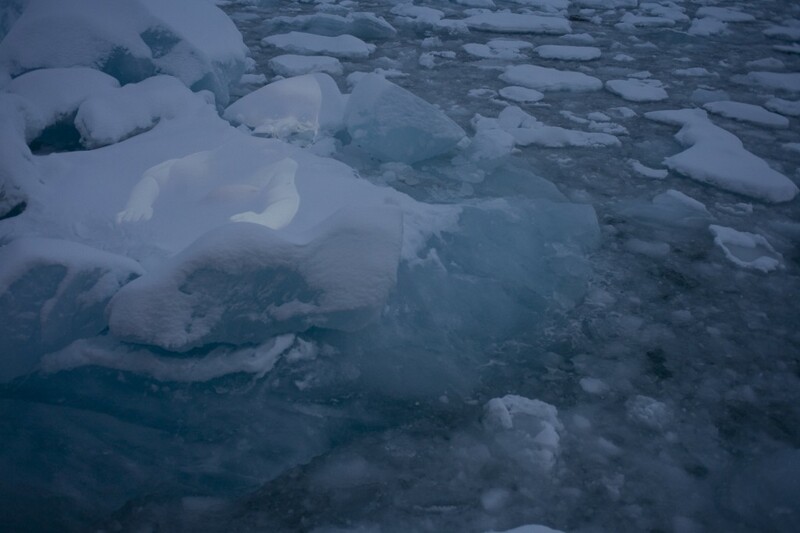 Oil has been found in the Arctic and it felt totally perverse that the substance that is causing the arctic to melt at alarming rates would then be drilled and mined in the Arctic just to be burnt and accelerate even further the Arctic’s demise. 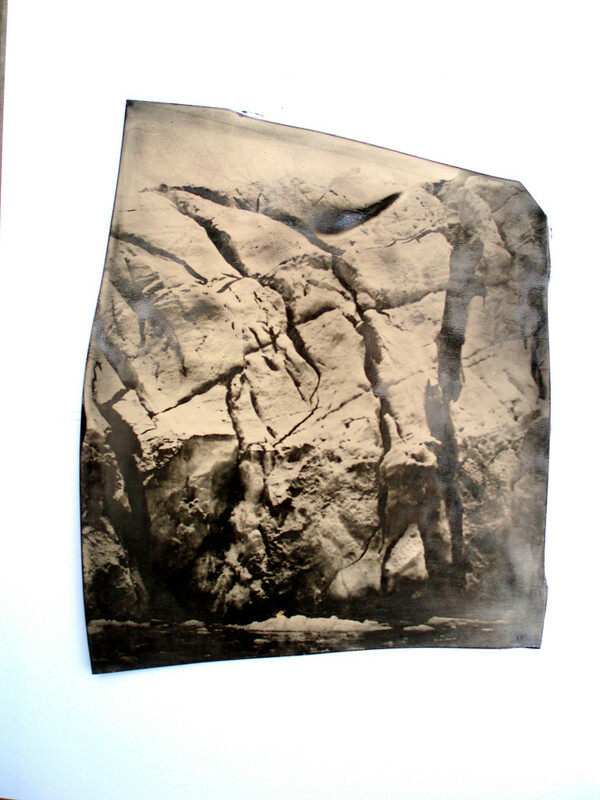 Wet plate collodian, a photographic process from the 1850’s, produces a negative that when coated onto black tin reads as a positive – a trick of reversal. 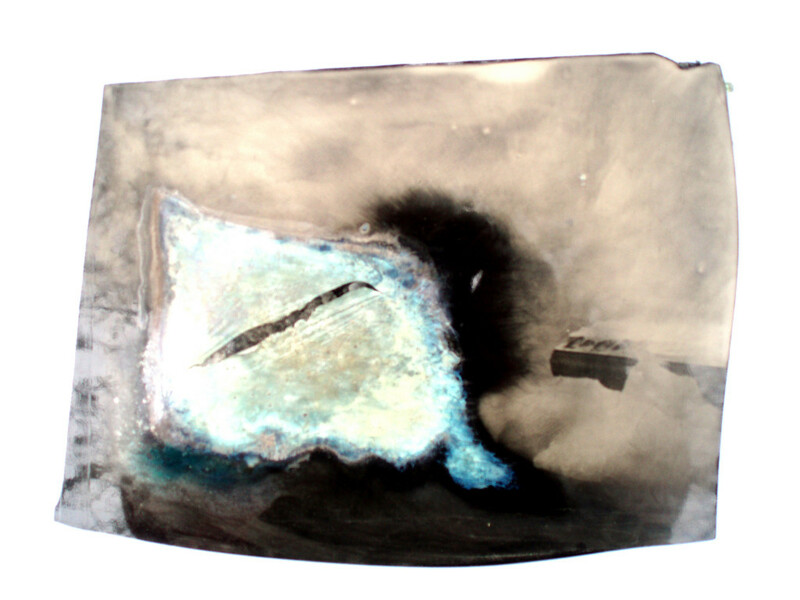 In my art I used shards of black glass, irregularly shaped, onto which I coated the silver suspended in collodian that I then exposed to images I had taken of ice made during our arctic expeditions. 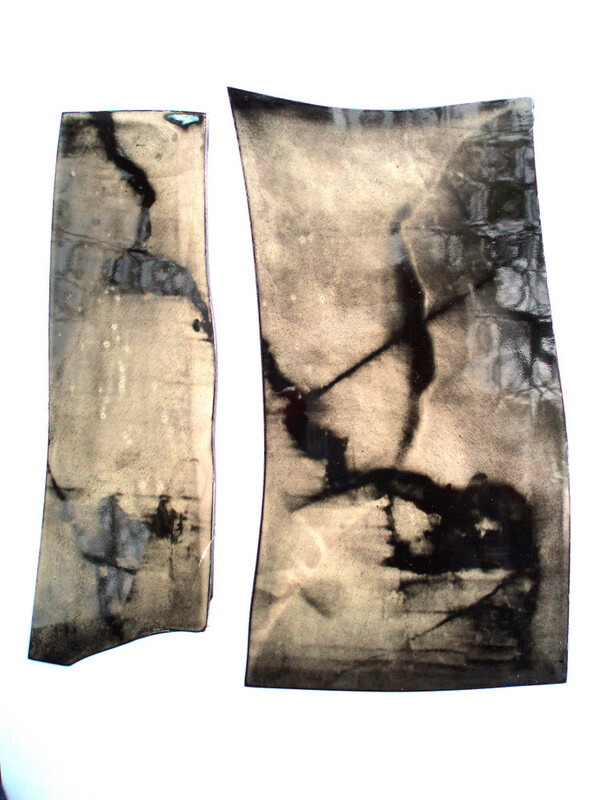 The process is not an exact science and I liked and used its wayward chemistry to cause blooms which then became blue tinges, I liked it when the dried collodian sometimes lifted from the black glass like an ice skin. The black glass shapes gave tension to the image and eventually all the arctic black glass shards were shown in two glass display cases like some anthropological record of something past. Ice has many qualities, it is not one substance but has a myriad of qualities and possibilities. When drilled as ice cores it can hold up to 800,000 years of planetary history. Deep down, 4 kilometres deep, the ice was formed 800,000 years ago and inside its tiny trapped air bubbles there is a record of the atmosphere at that time and inside its ice fabric there are trapped air blown pollens – these ice core are our record that allow scientists to understand the natural rhythms of our planet and how its temperature is in flux and, in addition, there is a record of how human habitation was formed. Ice is very magical stuff. 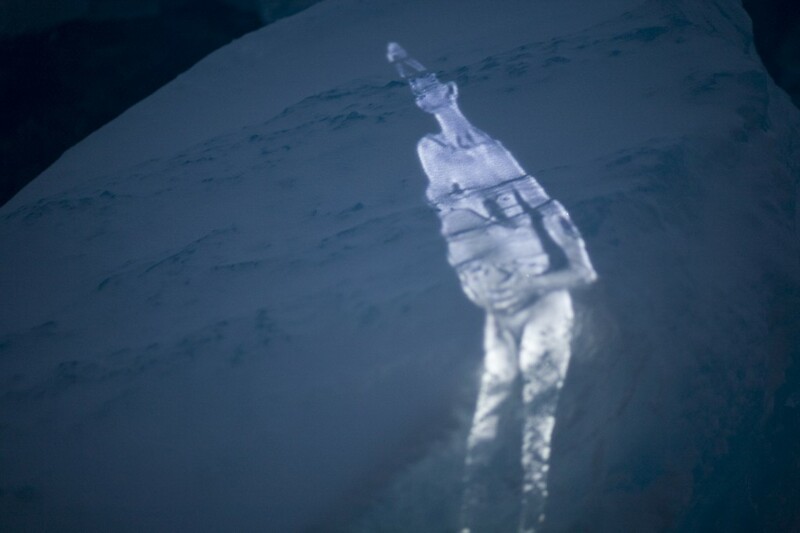 On each expedition I carried a video projector and persuaded the captain of our schooner to sail right up to the glacier walls and icebergs to allow my video projections to register on the ice. This was not a process for the faint hearted and I owe a deep debt of gratitude to the skill and adventurous spirit of our captain – these glacier walls carrying thousands of tons of ice which break off and crash into the ocean (or on our sailing ship) and the ten story Ice Bergs have a nasty habit of flipping over. 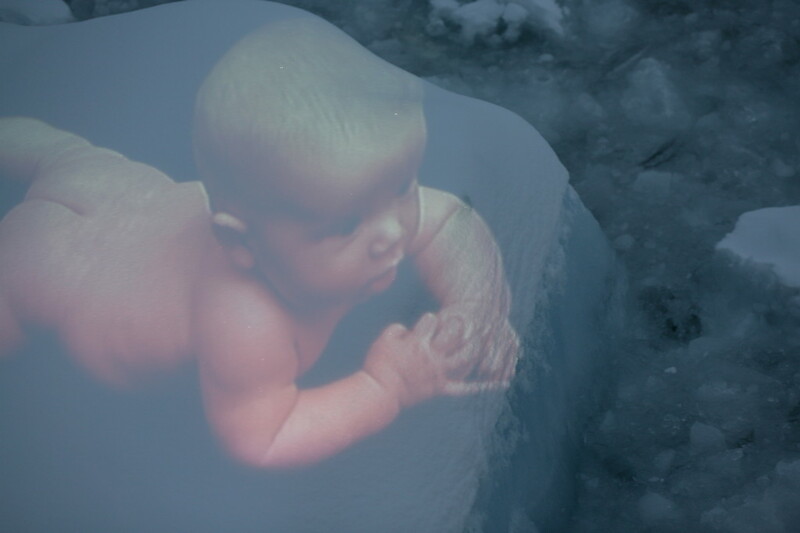 The projected image had to be worked during the half-light between dark and daylight, a time gap of less than 40 minutes and in a working temperature of between minus 20C and minus 30C. 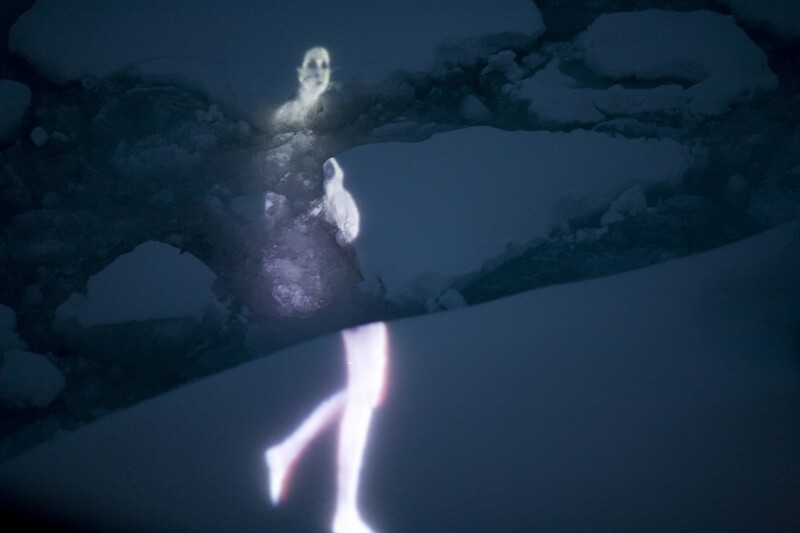 When the video projected image hit the ice, at times it would totally disappear into the ice and at other times it would reflect back with an ethereal luminosity. 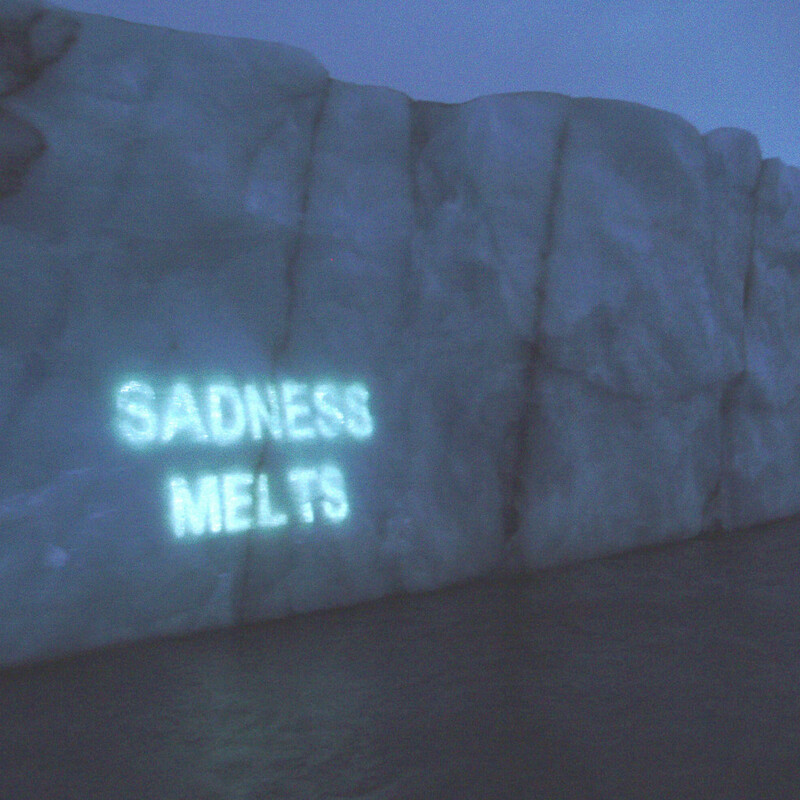 I projected texts, political or emotionally charged one liners, slogans, fragments of icy poetry. 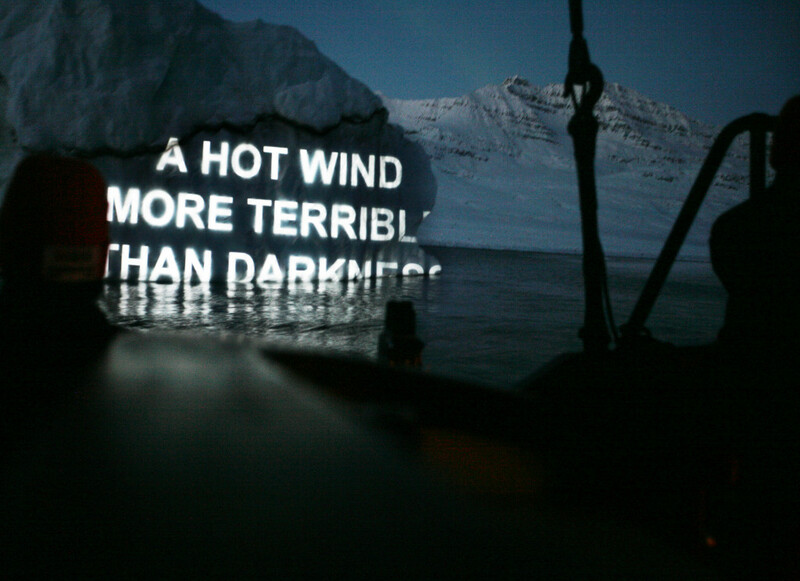 Over five expeditions over 60 text artworks have been made, sometimes in collaboration with other artists and writers. 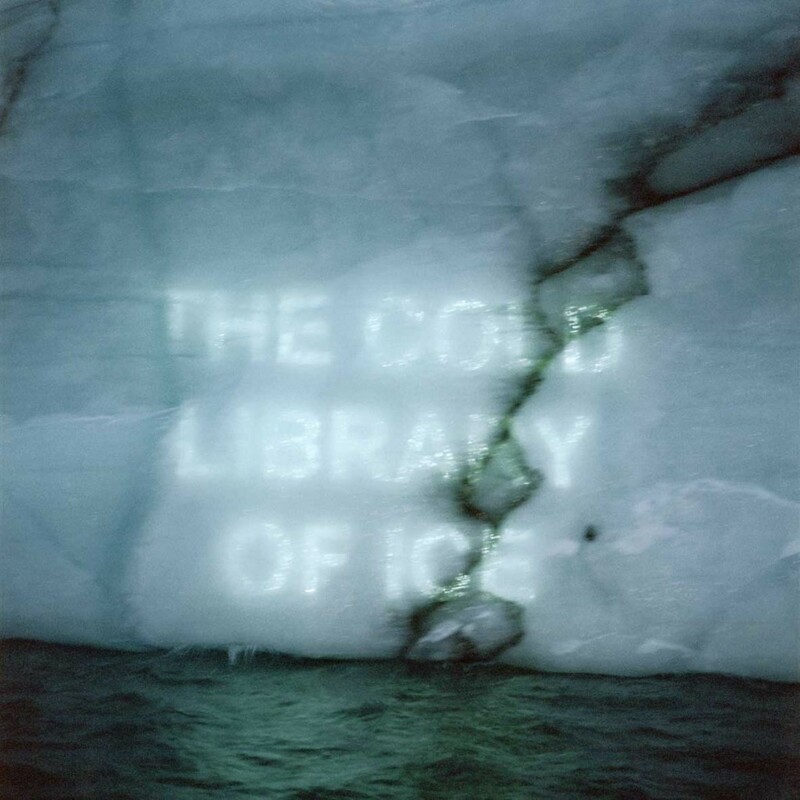 ‘The Cold Library of Ice’ refers to the ice cores, ‘Discounting the Future’ was a banking term used just before the world 2008 economic collapse and clearly such inane foolishness still exists when we are asked to address climate change. ‘Sadness Melts’ and ‘Burning Ice’ became a scientists favourite whilst ‘Another World is Possible’ give us justifiable hope. I had in previous work made a series of photographs of pregnant women and in 2006 I filmed a pregnant friend walking against a blue screen. 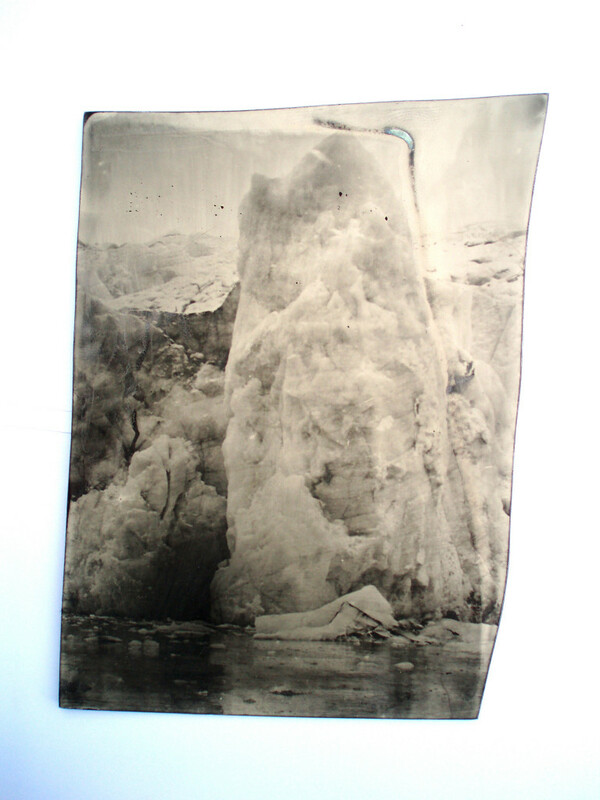 Subsequently I also filmed her newborn baby and used both video sections to project onto glaciers and the sea ice from the schooner. This I re-videoed and also made a serious of still artworks. 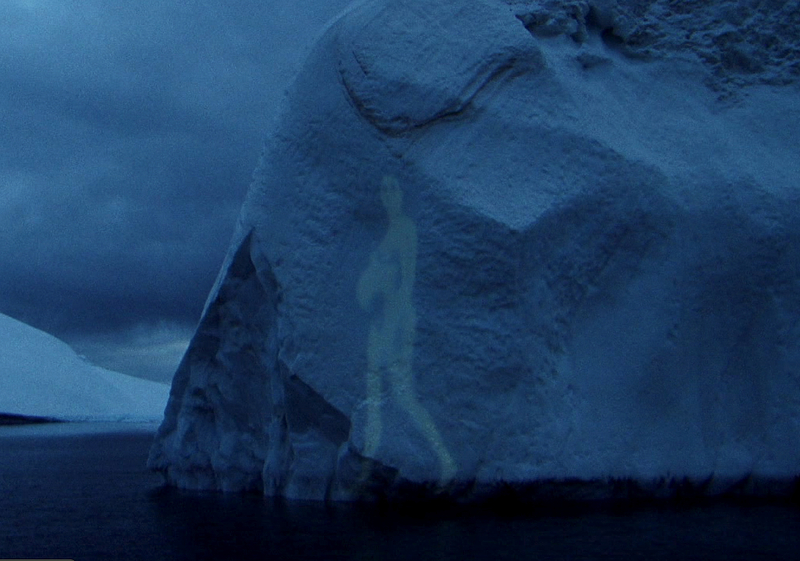 Watching this primal image of the naked walking pregnant woman as she transversed across glaciers and ice fields became another world and manifest itself as a disturbing glimpse at our future. By the time her baby is full-grown there will be no more sea ice in the arctic during the summer months. The responsibility of making an ice-free north pole caused by our reckless human behaviour is a reality we have to accept. 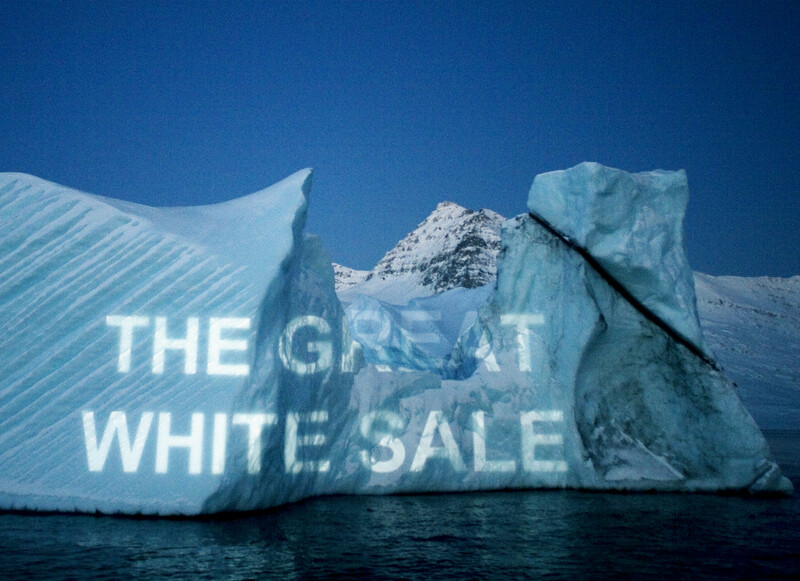 We are in the process of creating an intergenerational crime on a global scale. 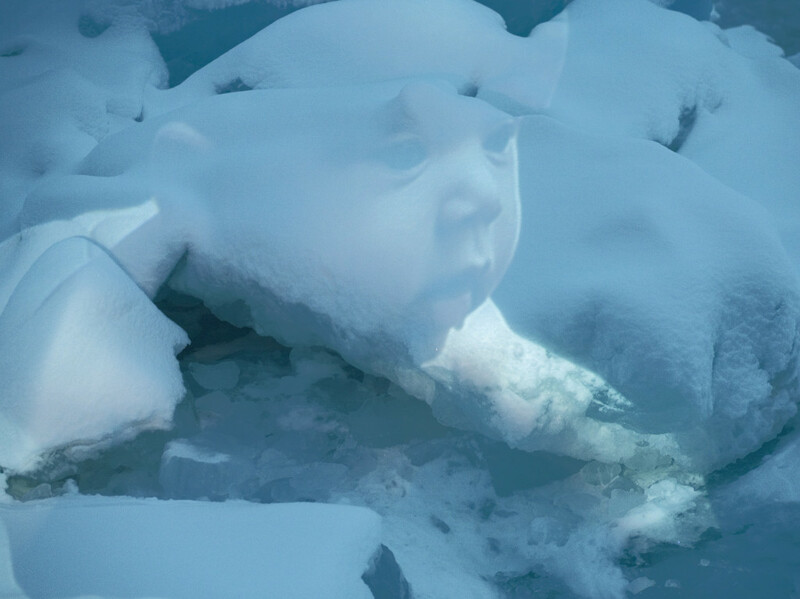 As I have stated, artists work in the milieu of their time; we face our humanity and its effect on climate change with a cold stare crafting works that are as emotionally alarming as the hard facts of our scientists. Words by Robyn Hitchcock. Musicians: Robyn Hitchcock and KT Tunstall. 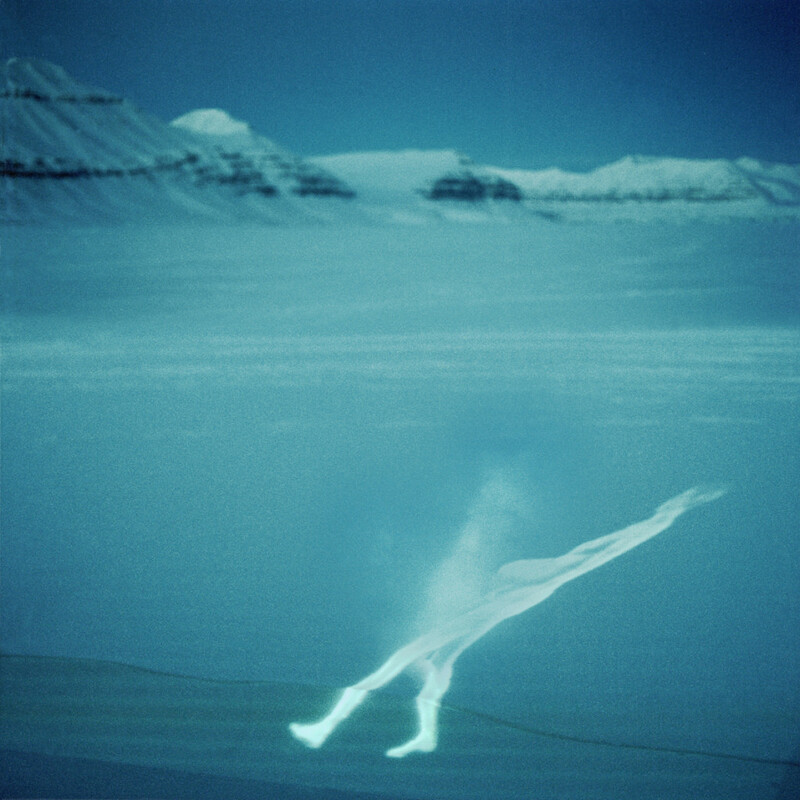 Inspired by Cape Farewell’s 2008 Arctic Expedition. Visual Artist / video by David Buckland.